The Sony i1 aka Honami cameraphone system dump from the other day has resulted in someone porting the software to the Xperia Z and other Sony gear, albeit unofficially, of course. We are looking at a somewhat updated interface indeed, but the biggest changes are within the camera app. The title bar and backgrounds for holo apps look similar to the Xperia Z but are not textured. There is apparently noise added to the dark app background, but it's hardly noticeable. It's overall a flatter look. Gone is the SoMA font. The UI uses Roboto throughout the system. There are a couple areas, such as the lockscreen clock and the plain digital clock widget, that use a font known as SST. Check boxes and radio buttons have a new look. Instead of the check mark/radio being coloured, the background is coloured (when the box is activated). Progress bars look more like holo progress bars, except with matching accent colours, like in the 2012 Xperias. Sliders and switches are still metallic and have the matching accent trail. The slider itself looks a little bit more refined, but nothing drastically different. Slider trails are not holo, but are not similar to the Xperia Z design. Section headers of lists will match the accent, along with dialog titles (as well as dialog dividers like in previous versions). Tabs are 3d and do not have any relations to accents, the content inside the tab will match the accent colour whether it's an image or text. Transition animations are different, but have some similarities to the Xperia Z's, where it fades and floats up. Here are some images of what the framework may look like in Honami, based off the default (blue) accent. This is on my Xperia arc with my modded framework-res. Remember, don't look at the apps themselves (I'm using ICS Xperia apps), but the smaller things such as switches, check boxes, radio buttons, action bar, tabs etc. 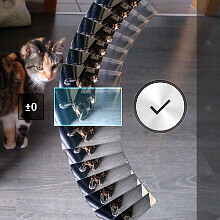 There are also a few pics taken with the Xperia Z loaded with the Honami interface and algorithms for an initial overview of the postprocessing amount one might expect from the Honami. My comment was removed in other post, I don't know why. I'll retype it. "I love quality products" I love Apple, LG, Nokia, SONY, HTC etc.. Apparently Sammysung is not one of them. I'm not a fanboy, I really love Q-U-A-L-I-T-Y! Don't remove this PA! I love quality products too and i like all products you mentioned above except apple and HTC..My apple products(ipod4, 3g, 3gs,4) ditched me and I doubt about HTC too..
Well if this doesn't dethrones GS4 then nothing will ! Since S4 unable to do what S3 can do in sales, So please tell me anything special about note 3 that can flatten the competition?? S4's sales may not have been what they anticipated but it surely is higher than S3 in every way. JK Shin confirmed this himself ! Also, higher sales doesn't mean the product is better. Can you back your statement with a link to the article, which points to decrease in market share ? I know the growth of S4 has slowed down but there is no way Samsung's market share has declined. If they are 'fanboy' of course they'll think Note 3 will be better than anything because they're 'fanboys' As for me, looking at the past record what Note Series has brought to the table I think they have a potential to WOW us ! I can't comment further before an actual launch but you can't just ignore them either ! Nothing ! He has a point there ! U can't call flat UI as a copy ! If they actually 'copy' something like their icons or their colors then its copy ! 'Flat UI' is not a copy in itself ! OMG when did you become such a WP fanboy.....stop loving WP and see that it is not the best OS in the world and that WP use metro ui instead of flat ui ......idiot! Lol stop this fan war! Fyi--I am also a fan of samsung.. I love Sony for their xperia Arc beauty and lovable UI look that i hope lags will not occur in this honami new UI..+ cybershot!!! I love samsung because of SuperAmoled, Note devices, Ativ Q, Galaxy NX, replaceable batt and microSD , useful and fun features esp MultiWindow, sidesync etccc, topnotch camera and battery life ;) I love Htc because of the design of their handsets..
Well Stop being a fan. If the product you want fits for you then what's the problem..
its funny that you find him fan when GMS85 is clearly going after Samsung, in a Sony article where it has nothing to do with Samsung. 'Sony will always always ALWAYS be the best!' is a fanboy statement that too without backing confirms that ! i never knew android smart phone can be so perfect until swtching to sony from samsung, bye bye samsung, i never belif in samsung again.